Waterstones booksellers are a very talented bunch. Our staff are writers, artists, film makers and almost any other creative discipline you care to mention. 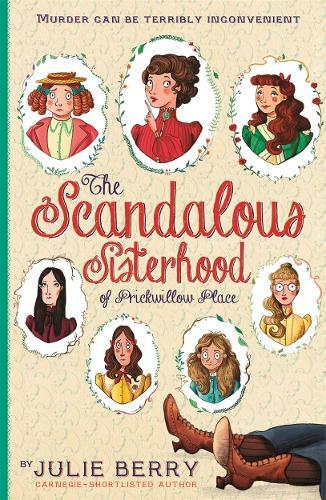 We're very proud to show off here the work of Nicola Kinnear, bookseller and illustrator of The Scandalous Sisterhood of Prickwillow Place. My first step in bringing the girls to life was to read the story. I was interested in both the descriptions of how they looked and their personalities, and wanted to convey both in the illustrations. 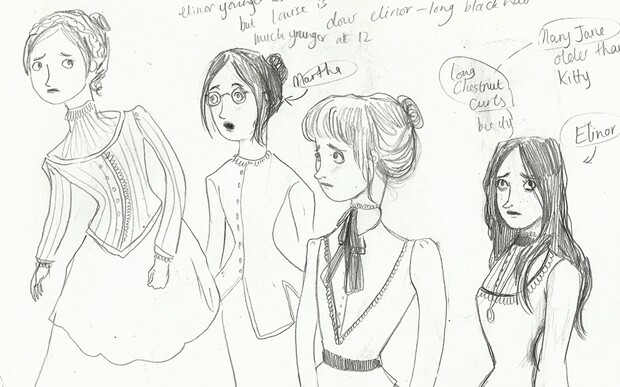 I find research crucial to the way I work and so I looked in detail at Victorian 1890s fashion and hairstyles to try and be as authentic as possible. 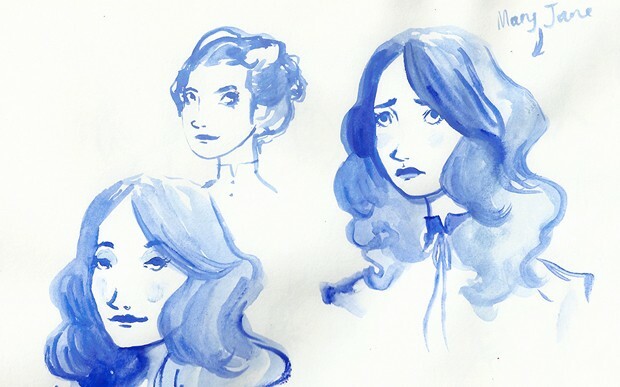 I draw constantly throughout this research stage, getting a feel for how it will work with the characters. My technique for finding the characters is quite thorough. I draw and keep re-drawing, trying different expressions, features and poses until something works, and then I draw some more! It was important to get all the girls looking individual from each other, which was quite a challenge.as there are seven of them! Once the characters started to take shape I looked at the composition that was suggested, doing quick thumbnail sketches. 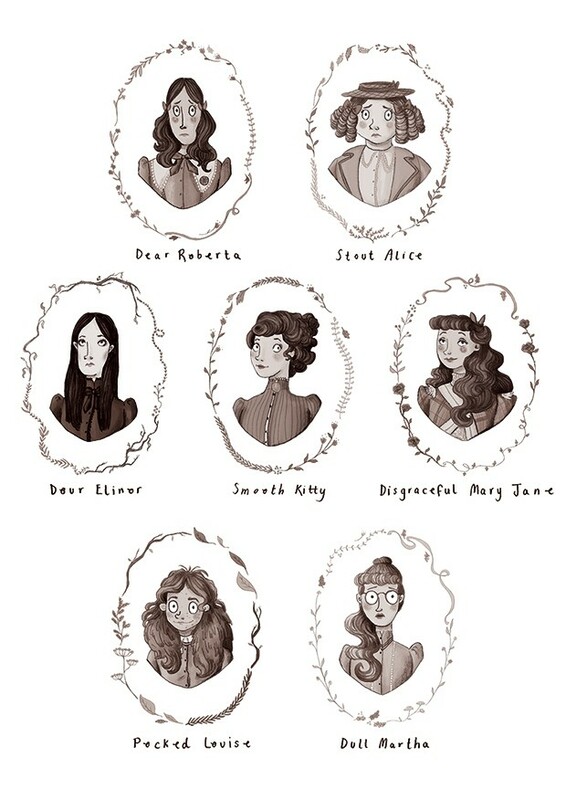 The girls’ portraits are shown inside the book, decorated with floral frames. I wanted to show more of each girl’s personality through the flowers used in her frame. Smaller delicate flowers for some girls, rustic practical herbs for others, and spikey looking plants for Elinor, the girl interested in more morbid and gothic themes. This was so much fun for me as I have a real interest in looking into different plants and flowers. It’s been such a joy to work on the cover illustration for Julie Berry’s novel, with its historical setting and seven wonderful main characters. A wonderful mix of farce and friendship starring seven fun female protagonists in this refreshing new drama from Carnegie-nominated author Julie Berry.